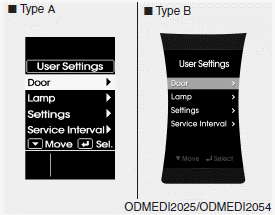 On this mode, you can change setting of the doors, lamps, and so on. The auto door lock operation will be deactivated. All doors will be automatically locked when the vehicle speed exceeds 15km/h (9.3mph). All doors will be automatically locked if the automatic transaxle shift lever is shifted from the P (Park) position to the R (Reverse), N (Neutral), or D (Drive) position. The auto door unlock operation will be canceled. All doors will be automatically unlocked when the ignition key is removed from ignition switch or Engine Start/Stop Button is set to the OFF position. All doors will be automatically unlocked if the automatic transaxle shift lever is shifted to the P (Park) position. The two press unlock function will be deactivated. Therefore, all doors will unlock if the door is unlocked. The driver’s door will unlock if the door is unlocked. When the door is unlocked again within 4 seconds, all doors will unlock. The Horn feedback operation will be deactivated. After locking the door by pressing the lock button on the transmitter, if you press the lock button again within 4 seconds, the warning sound will operate once to indicate that all doors are locked. If this item is checked, the headlamp delay and headlamp welcome function will be activated. If this item is checked, the welcome light function of the puddle lamp will be activated. If this item is checked, the lane change signals will blink 3 times when the turn signal lever is moved slightly. Convert the temperature unit from °C to °F or from °F to °C. If this item is checked, the welcome sound function will be activated. If this item is checked, the shift indicator function will be activated. For more details, refer to “Instrument Cluster” in this chapter. If this item is checked, the driver’s seat will automatically move forward or rearward for the driver to enter or exit the vehicle comfortably. The average fuel economy will reset automatically when refueling. The average fuel economy will not reset automatically whenever refueling. For more details, refer to “Trip Computer” in this chapter. 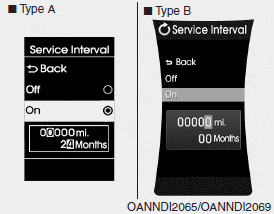 On this mode, you can activate the service interval function with mileage (mi. or km) and period (months).